Cut silver wire in two equal pieces and set aside. 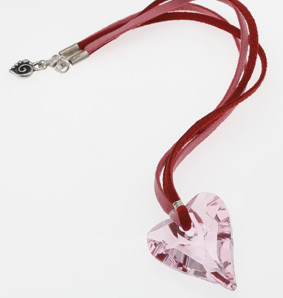 String the red and pink suede lace through the hole in the wild heart pendant from the Swarovski crystal assortment. Bring one pink and one red piece of lace together and wrap one of the silver wire pieces around both to secure. Repeat with other wire piece and other two pieces of suede on other side of pendant. Attach a fold-over crimp end to both the red and pink suede lace ends on one side of necklace and then repeat for other side of necklace. Fold crimp ends over with flat-nose pliers. Open both jumprings. Attach one to each fold over clasp. Attach the lobster clasp to one jumpring and the TierraCast® spiral heart to the other. Close both to secure.